Saturday 18 & Sunday 19 May 2019. 10-17 with 30 min lunch break both days. On this intensive lithography course you will learn the basics of black and white stone lithography. You will print a small edition of your own image that you can take home with you. There will be demonstrations of drawing materials, preparations, and printing of the stone. The second day you will be working together, printing a small edition of your own images. 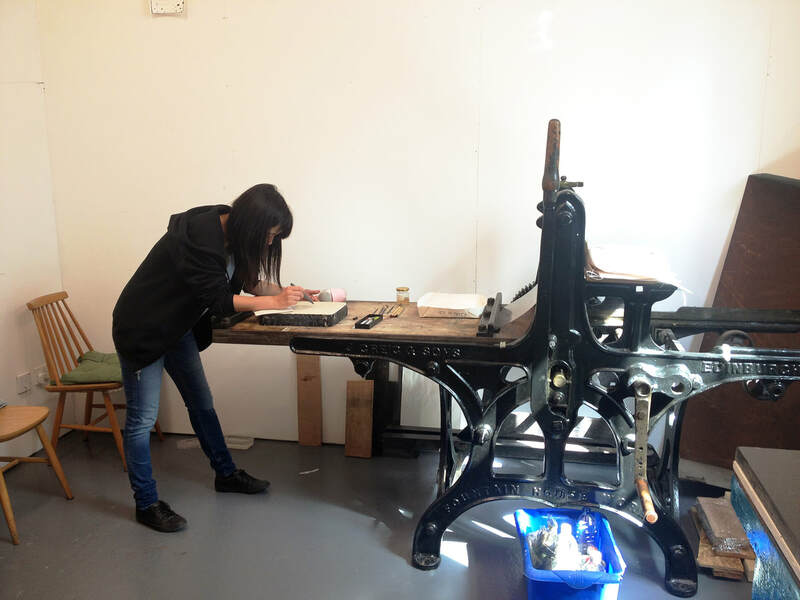 The course is suitable for artists with or without experience in lithography or printmaking, it also suits those who want to refresh their knowledge in lithography. If you have attended one of our courses before, don't worry, we can easy adjust the course for your level. No more than two artists partake in the course at a time. Lithography is a printmaking technique invented by Alois Senefelder in 1796. It is a diverse printmaking technique where you can achieve different expressions and styles. You can print in black and white or a range of different colours. Lithography has always been used as a fine art medium but it was also used for printing labels and cheques. Some printing techniques that we use today such as offset printing (used for printing books for example), originate from lithography. Traditional lithography is printed from lithography stones, a special kind of lime stone and it functions on the fact that grease and water repel each other. During the course you will create your images onto the stone and print them of the stone onto a paper. When the printing is done the images are grained away from the stone and it can be used over and over again. Your tutor during this course will be Nora Hammenberg, the owner of Stone Tree Press. She is a certificated printer by the prestigious Tamarind Institute of Lithography in Albuquerque, New Mexico, USA. She also studied printmaking at Gothenburg School of Art in Gothenburg, Sweden and at Ålgårdens Print Workshop and Galleries in Borås, Sweden. Nora is dedicated to sharing her knowledge of lithography to keep these traditional skills and techniques alive. Because of safety reasons our courses are unfortunately for those over 18 years old. Full payment is required at the time of booking to secure your place at the course. If you have any mobility requirements please contact Stone Tree Press for details about accessibility at Stone Tree Press and Patrick Studios. Stone Tree Press will give a full refund if you cancel no less then 14 days before the first day of the course. If you cancel after the notification period of 14 days we are unfortunately unable to give a refund. Stone Tree Press reserve the rights to cancel the course. If a course is cancelled Stone Tree Press will issue a full refund.